Kindergarten can be an exciting time for both parents and children. The transition to full-day school brings new skills, new friends, and new opportunities and experiences, but while some kids make the transition with ease, others really struggle with the adjustment. Teaching children self-control is one of the most important things a parent can do for their kids. Some studies suggest that a child’s level of self-discipline at a young age can predict how successful – and happy – he will be later in life, and while some might argue against such findings, the facts remain the same: if you take the time to teach your child strategies for self-control now, you will be setting him up for long-term success at school, work, in his personal life, and beyond. From managing impulsive behavior, resisting distractions, and learning the art of delayed gratification, to regulating emotions in the face of conflict and feelings of discomfort, self-regulatory behavior is key to success in all areas of our lives, and since children with poor self-control tend to exhibit more behavioral problems than their self-disciplined peers, teaching children self-control is more important than parents might think. Related: That Rule Doesn’t Apply to Me! So, how exactly do we, as parents, do this? How do we teach our kids the art of self-discipline and self-regulation without spending all of our free time battling meltdowns, temper tantrums, aggressive behavior, and feelings of defeat? Because, let’s face it: it’s sometimes easier to give kids what they want rather than subjecting ourselves to a day filled with power struggles and time-outs. Amiright? The good news is that learning how to teach children self-control isn’t as difficult as it sounds. Yes, it takes time, patience, and dedication on the part of the parents and caregivers, and there will be days that your child may not comply with your wishes, but the long-term benefit of working with your child to help develop his self-regulating behavior far outweighs the short-term pain. Here are 7+ strategies and activities to teach children self-control. This is especially important in young children. By explaining what the rules are, what’s expected, and what is and isn’t appropriate, and taking the time to give your child regular reminders, you are setting him up for success. The easier the rules are, and the more consistently you reinforce them, the easier it is for your kids to meet your expectations. We all know that kids thrive on consistency, and getting your children used to a predictable routine will not only help with the transition to full-day school, but also help set expectations as to what is expected throughout the day. By setting clear boundaries around different activities – learning, independent play, outdoor time, quiet time, eating, etc. – you can help teach the different types of self-regulation needed in the classroom and beyond. The younger a child is, the more easily he can (and will) be distracted, so taking the time to give him reminders at regular intervals will go a long way in helping him learn the art of self-control. Reinforcement is a fabulous technique parents and caregivers can use to increase the likelihood that a child will repeat a desirable behavior, and while both positive and negative forms of reinforcement can help with teaching children self-control, research tends to suggest that positive reinforcement is the most effective. Sticker charts are a simple, yet effective, form of positive reinforcement that can be extremely motivating for kids. This Dry Erase Reward Chore Chart is my favorite as you can easily customize it for your individual child. As parents, we often hear about the importance of being consistent and following through with consequences. If you fail to follow through, your child won’t take you seriously, learn accountability, or figure out the difference between right and wrong. And while this makes perfect sense, what many parents forget is that the same holds true for rewards. If we neglect to make good on our promises, we take away the motivation our children need to make positive changes to their behavior, which can significantly impact our ability to teach our children self-control and self-discipline. Another important, yet often overlooked parenting strategy is the importance of being a good role model. Our children look up to us, and oftentimes want to mimic every single thing we do, and when we take the time to actively demonstrate our own self-regulatory behavior, we are setting our kids up for success. Thinking before acting, practicing deep breathing, being kind and compassionate to others, and using appropriate language to express our feelings are all positive ways to teach your child self-regulating behaviors to help develop self-control. When it comes to teaching self-control, there is no ‘one-size-fits-all’ approach. Every child has a different temperament, and what works for one may not work for another. The good news? There are HEAPS of great self-discipline activities for kids that feel more like play than work, offering a fabulous, stress-free way to help children with self-control issues. Here are 30 of our favorite self-control activities and resources for kids and parents! 1. Blow bubbles. It’s no secret that taking deep breaths can help restore a sense of calm when big emotions hit, and a great way to teach this concept is to have children blow bubbles when they’re feeling anxious. Start by giving each child their own bottle of mini bubbles to practice, and once they’ve mastered the concept, have them practice blowing bubbles without the wand. This will give them an effective coping strategy they can use when big emotions threaten to take over during the school day (and beyond)! 2. The marshmallow test. Stock up on some yummy marshmallows and give this activity by Teaching in Blue Jeans a try. It’s a great way to teach the art of delayed gratification, and it’s delicious to boot! 3. Watch Sesame Street. If your child loves Sesame Street, this clip with Cookie Monster will get her laughing while also showing the importance of resisting temptation and being patient. 4. Calm Down Jars. Learn how to make calm down jars using nothing other than glue, water, and glitter, why they are effective, along with 17 DIY recipes you can make at home with your kids HERE. 5. Red Light, Green Light. You probably remember playing this as a kid, and it’s a fun game to help kids work on self-control. 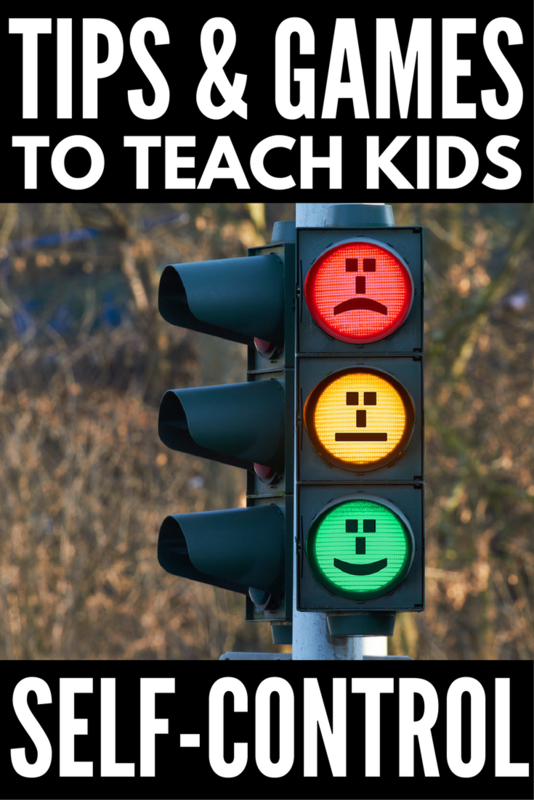 Each time you yell ‘green light’, your kids can get up, dance, and act silly, but as soon as you yell ‘red light’, they must stand perfectly still. It’s heaps of fun! 6. Self-Control Task Cards. This set on Teachers Pay Teachers contain 60 task cards to talk about self-control and promote deeper and more critical thinking. 7. Simon Says. Kids love this game, and you can make it extra motivating by giving each of your children a turn to be ‘Simon’ as a reward for good behavior, helping around the house, completing homework, etc. 8. Feelings Parking Lot. Grab a poster board, some toy cars, and a sharpie, and give this activity by Therapeutic Interventions a try! 9. Chi Flow & Phreeze Yoga Game Card Deck. Yoga is a great way to help kids calm down and refocus when their emotions start to get away from them, and Chi Flow & Phreeze Yoga Game combines yoga and Twister to do exactly that! 10. Don’t Take the Bait Game. Perfect for kids in third or fourth grade, this game on Teachers Pay Teachers is designed to help kids identify strategies to use in the face of triggers that impact their ability to stay in control of their emotions, thoughts, and behaviors. 11. Musical Chairs. Another great activity to teach self-control is musical chairs. Make a circle of chairs in the center of the room, ensuring there is one less chair than there are kids participating in the game, and then switch on some fun music. The idea is for the kids to run in circles around the chairs while the music is playing, and once the music stops they must quickly find a chair to sit on. The person left standing is out of the game, and another chair is taken away until there is only one chair (and one winner) left. 12. Emotions Match Up Uno. Teachers Pay Teachers has a great game that is similar to the classic card game Uno, which is designed to target both social skills and emotional regulation. You can check it out HERE. 13. My Mouth is a Volcano. Teachers Pay Teachers also offers a great add-on to Julia Cook’s book, My Mouth is a Volcano, which includes an eruption checklist, eruption cards, and a self-control writing activity. You can learn more HERE. 14. Don’t Bite. Similar to the Marshmallow Game, this one involves sticks of gum and is a bit harder from a self-control point of view. The idea is to place the stick of gum onto the child’s tongue, and then see how long they can go without chewing it. 15. Organize a ‘Feelings and Emotions’ Scavenger Hunt. Mosswood Connections put this idea together, and I think it’s a great way to help kids understand their emotions while also practicing important social skills. 16. Turn Taking Games. Kids love to play games, and getting them involved in ones that require them to wait until it’s their turn can be a great way to teach self-control. Some of our family favorites include Pop the Pig, Toilet Trouble, Don’t Wake Hank, and Lil’ Lemonade Stand-Off. 17. Create a Reward System. Sticker charts are a simple, yet effective, form of positive reinforcement that can be extremely motivating for kids, and I love this Magnetic Reward and Responsibility Chart as you can easily customize it for your individual child. It’s important to note that teachers aren’t always fond of using this technique in the classroom as it involves rewarding students for doing what is expected, but it’s a great tool to use at home! 18. Create a Calm Down Box. Another way to teach children self-control is to ensure they have tools readily available when big emotions strike. Fidget toys, squeeze balls, and chewing gum are all great classroom-appropriate ideas that can help reduce feelings of anxiety and restore a sense of calm. 19. Hide and Seek. Yes. A good ‘ole fashioned game of hide and seek in your backyard or at your local park can teach kids self-control. Staying completely silent while hiding isn’t easy, and maintaining your composure when you’re ‘IT’ and can’t find anyone can be pretty challenging as well. 20. Hot Potato. We used an actual potato to play this game when I was a kid (I’m old), but I recently found a Hot Potato Game on Amazon, complete with silly sounds!!! 21. Zones Bingo. If you’re familiar with the Zones of Regulation program, you’ll love this Bingo game by lunchbuddiesplus! 22. Don’t Laugh. A friend of mine does this ALL THE TIME with her daughter, and it’s a real hoot. They take turns trying to make the other person laugh. They aren’t allowed to touch each other and must maintain eye contact, and it is HILARIOUS to watch both of them in action. 23. Twister. Twister is a great game to help develop a child’s gross motor skills and work cooperatively with his or her peers, and it also offers a way to teach self-control. Don’t own the game? You can buy the classic Twister set here. 24. Self-Control Circles. If you’re in search of some calming, zen-like activities to teach your kids how to distinguish between the things they can and cannot control, this self-control circle craft on Teachers Pay Teachers is fr you! 25. Read. There are lots of great children’s books that are fun to read AND touch on the topic of self-control. Our favorites are No, David!, My Mouth is a Volcano, I Just Want to Do It My Way!, and I Can’t Believe You Said That!. 26. Playdough. Engaging in a good sensory activity with your child can help calm even the biggest emotions, while also offering an opportunity to talk with your child, get a sense for his or her feelings, and brainstorm better behaviors to use in the future. I’ve always found playing with playdough to be relaxing, but coloring is pretty high on my list as well! 27. Guided Meditation. There are so many great (and free) guided meditation clips available on YouTube. Here’s one of my favorites! 28. Control-O-Meter. Originally designed to help kids with autism gain better control of the loudness of their voices, this Control-O-Meter by Autism Teaching Strategies can be used to help with various behavioral and self-control challenges. 29. Self-Control Bubbles. Love, Laughter, and Learning in Prep has a great self-control game that uses nothing more than a bottle of bubbles. Check it out HERE! 30. Jenga. Ah, I love Jenga! It requires great skill to remove and place blocks on the top of a tower, but what few people realize is that it also takes a lot of self-control for impulsive children not to knock the tower down while playing! Learning how to teach children self-control before they enter school – and continuing to do so as they learn and grow – can have a huge impact in helping them develop the self-discipline and self-regulatory behavior strategies they need to cope and learn in the classroom (and beyond). The more you focus on helping your child learn the art of self-control, the more you are setting him up for long-term success with his eduction, career, and personal relationships. It may seem daunting at first, but using positive reinforcement, following through with rewards and consequences, modelling good self-regulatory behavior, and getting your children excited about some of the self-control activities for kids noted above will give you the foundation you need to give your little ones a good head start. If you found our strategies to teach children self-control helpful, please share them on Pinterest!